Via Facebook and Twitter, I'm still reading about folks putting up the last of their tomatoes for the winter, so I think you'll find this post quite timely. While I do grow my own tomatoes in my garden, my yield is often not what I hope. I have also had much better luck with small, prolific tomatoes like Sungolds than with bigger, beefier tomatoes, ideal for slicing and canning. So, like many of you, I usually turn to my local farmers when it's time to put up tomatoes for the winter. This year, I bought half a bushel. Now, that may not seem like much but, trust me, when you wash them and line them up on the kitchen counter, it's a lot. I didn't weigh my box but a quick search shows that the standard weight for a bushel of tomatoes in the United States is 53 pounds. So I'm guessing I had about 25 pounds of tomatoes. Instead of simply making the whole lot into sauce for the freezer, I got a little creative this year. I turned a good portion of the tomatoes into marinated dried tomatoes, which are a winter-time staple at Casa de Ninj. Holy crap, these tomatoes are so so SO good. I use them on pizzas, and they are even better rehydrated in a cream sauce over pasta. I've posted the recipe before, so be sure to check it out. About two-thirds ended up as a sauce base. Why a base, not a full sauce? Laziness -- whoops, I mean STEALTHINESS. I coarsely chopped the tomatoes and threw 'em in a big pot with a little water and cooked them down for about an hour. Then I immersion blended them (skins and seeds, too -- I'm not fussy) and put them into 2-cup containers in the freezer. When I decide to make pasta sauce, I just defrost as many portions as I need. But my sauce base always needs a little oomph. I usually wind up sauteing some ground beef or turkey with onion and herbs to add to the base, along with a little tomato paste. 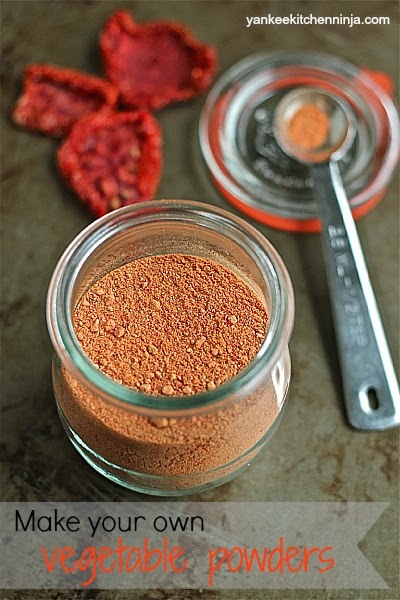 Then I realized that I could make an even better oomph-builder: dried, powdered tomatoes. So that's how I used my the remainder of the half bushel. My cousin recently bought a dehydrator (come on, after all my dehydrating posts, you know you need one!) and tried her hand at making vegetable powders. She let me know how incredibly easy it was so I gave it a shot. Slice the tomatoes about 1/4-inch thick, lay them on the dehydrator trays and dry at 145 degrees until ridiculously dry and brittle (they should break like potato chips). With my Excalibur dehydrator, this took about 15 hours, so be prepared for the long haul. 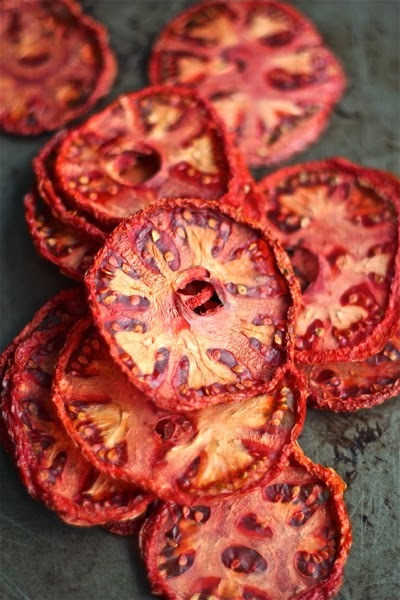 Once thoroughly dried, simply pulverize the bejesus out of the tomatoes in a coffee/spice grinder (the best option) or, if you don't own a grinder, in your blender or food processor. You want to grind them enough so they turn into powder. Store them in an airtight container and add a spoonful to things like soups and sauces. Wherever you need a little more oomph. And then, frankly, just go crazy: you can dry all sorts of veggies this way. Spinach and kale powders would be perfect for greening up a smoothie, don't you think? How do you use vegetable powders? Leave a comment below: The Ninj wants to know. What a great idea! They look so pretty though, I would almost hate to pulverize them! We started doing this earlier this week with the pulp leftover from our juicer. It isn't one type of fruit or veggie by itself but we turned it into a powder using your dehydrator and our Bullet. We are storing it in a mason jar and using it in taco meat, spaghetti sauces, and smoothies. That is a seriously great idea -- thanks for sharing! I've been doing this for awhile with fermented veggies. I usually have some kraut or whatever leftover in jars in the bottom of the fridge. Will take everything once I have a dehydrator full and dry them at the lowest temp available (95 on my machine), to preserve the probiotics, then grind them up. Because it's been fermented in brine, it retains a lot of salt and makes a really cool, healthy seasoning. What a great idea, Erik -- I'm going to have to give that a try! What a score! Erik I am so grateful for this idea. Going to try this! Thank you. This is probably a dumb question but do they need to be kept in a refrigerator or stored like regular spices? Have you tried this technique with other vegetables that you would recommend? Not a dumb question at all! Just store them as you would regular spices -- no refrigeration required. You can do this with any veggie (or fruit) you like: I've made herb powders, plus I think onion powder would be SUPER handy. Or even an orange or grapefruit powder for baking! I really wanna make some vegetable powder as part of a homemad gainer shake :) But how long will the powder stay good for? If you keep them in airtight containers, they'll keep a long time. I've had some tomato powder and some mushroom powder that's well over a year old and still going strong in my soups! I just tried to make a post but it didn't show up. If this is a repeat then I'm very sorry for that. I just got an Excalibur 4 tray dehydrator for my 46th birthday. (My birthday's actually coming up on Sunday, I got my gift early. ) I have been wanting a dehydrator for years, finally got one. I can't wait to try vegetable powders. I love kale and have been wanting other ways to use and or eat it, and I think this will be great. I follow a woman on YouTube who dehydrates it and uses it like parsley or chives, just kind of sprinkled on the top of dishes like pizza, lasagna, or even just buttered toast. I think this is an awesome way to get an extra boost of nutrition and I'm very excited to try it. Thanks so much for sharing.